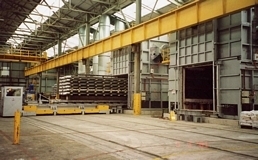 The Homogenising Furnace is designed to provide consistent heat treatment of aluminium logs. This complete operating system comes with Charging Machine and Coolers. It can be heated with electric elements or gas/oil combustion systems. The body of the oven is robust and constructed of mild steel with high quality insulation to reduce heat loss. Designed with large doors for easy access to the work chamber. Uniquely designed louvre for channeling recirculated air through the work chamber and evenly distribute heated air over the product. Integrated PLC control system for safe and correct heat treatment cycles to the preset program. Charging machines travel on floor mounted rails for load transfer to the furnace and cooler. Complete electrical and hydraulic controls for safe operation. Commissioning by experienced engineers to ensure seamless interface with the entire equipment system.